This popped up on my Facebook page Saturday and it is right up my alley. I would have to say it pretty much sums up my philosophy. I am trying to eat less and healthier. I am moving more by walking. I am buying less and buying as many previously owned things as possible. I need to get back to making more. I am meditating more, which helps me to stress less. I am finding ways to laugh more, even when the day seems like it has gone in the sewer. I am feeling blessed every day. I do this by thinking of all the wonderful things I have in my life. I am feeling love more. How could I not when I know that I have three amazing grandchildren who love me. And yes, every day I find a quiet spot and just breathe. I put away the computer, I turn off the TV, I close my book, and I just sit and breathe or meditate. For me, nothing beats simple living. 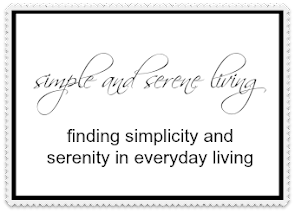 What are you doing that simplifies your life? I am trying to follow these same guidelines. In the past several years, my life has been so hectic tat it began to get me down and I rarely had time to enjoy anything. At the moment, it's still very hectic, but I made up my mind that from now on I am going to do things more at my own pace instead of trying to please everyone else. I am purposely seeking peace throughout my day. It has made such a huge difference so far! I think I'm on the right track and hope it will continue to get better and better. I like that message too! I have recently started back doing yoga. I was walking one day, then yoga the next etc. until it got too cold. I need to get back out there on pretty days though. Fresh air and walking really rejuvenates me. The yoga is a great stress reliever and good for my arthritic issues. I need to focus more on these things. I've been so busy I've let the stress build up again. Thanks for the wonderful reminder to just breathe!! we need to remind ourselves of just those things. You are so right. I really like this post. For my own pursuit of simplicity I am clearing out a lot of not only my stuff but the things I inherited from my grandmother. I'm in a house filled with too many things, however beloved, and it was getting to be way too much to maintain. I've been experiencing a lot of joy by sharing these things with others who will actually use them instead of just 'saving' them for a later special occasion. I get very anxious when things start to pile up. In your last post the "be productive but calm" advice was like a balm. I will be using it as a mantra. Losing the anxiety will simplify things a lot. Thank you. That's beautiful, and should be on a wall in every home. I really like this! I am trying to stay consistent with my quiet/prayer time in the morning. Embracing each new day with gratitude.. This is a smart manifesto! I am buying less and using what I already have. I do need to slow down and take more quiet time! Laure, I love this and it so accurate!! I still have to work on the "stress less" part!